Satellites are being used to look at practically everything you can think of. Well, maybe not. But if you take a single subject like ice, it is amazing how many ways you can look at it with a surprisingly large number of satellites. A random visit to a session or two here at the ESA Living Planet Symposium in Bergen show a small selection of ways to look at ice from space. GlobIce main purpose is to define, implement and validata a sea ice information system. This system will support the World Climate Research Program called CliC with validated sea ice motion, deformation and flux products that are derived from SAR data (in the ESA archive). Here in Bergen we got a status report saying that they were about to embark on Antarctica after having tested the 'tool kit' out in the Arctic. It was the view from space that revealed the mystic rings on lake Baikal in Russia. A number of satellites have been used to try to figure out what magic created these rings. It seems to be some kind of giant bubbles with gas that best explains it. For now. 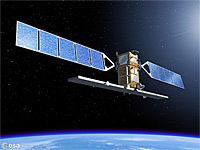 The SAR Ice Constellation project is investigating the benefits of the ESA’s planned Sentinel-1 satellite for sea ice monitoring, by using it in combination with SAR data from a constellation of other satellites. The constellation will be useful in a number of fields like oil spill monitoring and ship detection. The prototype for this constellation will be ready this summer and a full version is expected by the end of 2010. And this is just a tiny bit of all the stuff we can find out using satellites - about ice - alone! 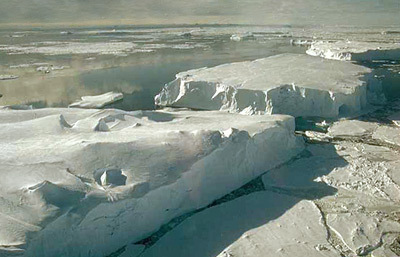 For more on sea ice check out Chatter Box!